An angel possesses the following traits (unless otherwise noted in a creature’s entry). Protective Aura (Su) Against attacks made or effects created by evil creatures, this ability provides a +4 deflection bonus to AC and a +4 resistance bonus on saving throws to anyone within 20 feet of the angel. Otherwise, it functions as a magic circle against evil effect and a lesser globe of invulnerability, both with a radius of 20 feet (caster level equals angel’s HD). The defensive benefits from the circle are not included in an angel’s statistics block. Truespeech (Su) All angels can speak with any creature that has a language, as though using a tongues spell (caster level equal to angel’s Hit Dice). This ability is always active. All angels have numerous immunities and damage resistances, allowing them to travel across many planes of the multiverse without fear of damage. Interestingly, they can still take damage from poison, but they are strong enough to withstand most ill effects and punish those who would inflict such treacherous pain on them. They are exceptionally vulnerable to unholy weapons; solars are also vulnerable to epic-strength weapons and artifacts. Angels’ protective auras grant them protection against attacks made or effects created by evil creatures, as well as protecting those creatures around them. Any mortals who wish to deal with angels should be armed with humility and knowledge. Angels are immune to acid, cold, and petrification effects. They also have resistance to electricity 10 and fire 10. Astral Deva (SR 25): Astral devas are the messengers of the gods of good—or, if one were to be cynical, the gossips of the heavens. The appropriate gift for an Astral Deva is knowledge of a place it cannot reach: a rival temple, the location of evil cultists, or some other evil that has a direct bearing on the Material Plane. Cassisian: The weakest sort of angels, cassisians serve as the messengers of more powerful angels, and frequently serve good spellcasters on the Material Plane as familiars. Formed from the souls of pious soldiers, they are often simply appeased with gifts that allow them to join the fray against evil creatures. Monadic Deva (SR 23): Watchers of the Ethereal Plane and the Elemental Planes, monadic devas usually serve those who summon them only in purposes that deal with their duties on those planes. Stubborn in their causes, they demand outrageous gifts of servitude toward their own lofty goals. Movanic Deva (SR 21): Soldier angels who often patrol the Positive Energy Plane, Negative Energy Plane, and Material Plane, these devas battle undead and the strange creatures that hunt the hungry void. When summoned to the Material Plane, they serve as forthright soldiers for the cause of good, and are appeased with gifts that allow them greater power to hunt undead and sceaduinar. Planetar (SR 27): As the leaders of celestial armies, planetars seek knowledge and information regarding the plans of their infernal foes. Providing valuable data regarding the movement of evil forces, the locations of caches of evil weapons, or the locations of portals to the netherworld gives the binder a +2 Charisma bonus when dealing with planetars. Solar (SR 34): The greatest warriors of goodness, solars do not typically treat directly with mortals. To summon a solar and bargain with it, a wizard must destroy an item of great evil in the solar’s name, crush a powerful evil in the world, or offer an evil relic as part of the summoning. Angels respect the written word as it pertains to the efforts of good, and many also revel in the destruction of the fiends of the evil Outer Planes. Astral Deva – The couriers of the celestial planes, astral devas carry messages between good deities and empyreal lords. Preferred Offering: A roll of fresh, unspoiled parchment in a jeweled scroll case worth at least 100 gp. Balisse Angel – These angelic beings provide guidance to the morally conflicted. Preferred Offering: Five copies of a holy text, to be distributed to those in need of guidance upon a successful summoning. 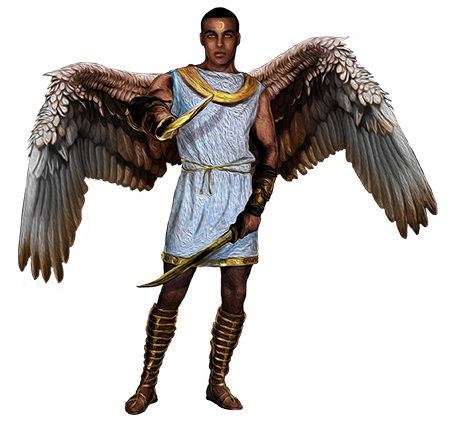 Cassisian – Cassisians appear as winged helmets of various styles and often serve as familiars to good spellcasters. Preferred Offering: A holy text from any good religion scribed in silver ink. Choral Angel – These small, winged angels possess magical voices. Preferred Offering: A quality performance from a good-aligned singer. Monadic Deva – These angels monitor the Ethereal Plane and the Elemental Planes. Preferred Offering: A mace with a head fashioned into the holy symbol of a good god, with a promise to donate the mace to the appropriate temple after using it in 33 consecutive battles. Movanic Deva – Movanic devas are infantry units in celestial armies and serve as emissaries to the Positive, Negative, and Material Planes. Preferred Offering: A pledge of at least 250 gp to be donated to a good temple. Planetar – Planetars are fierce warriors dedicated to destroying evil in all its forms. Preferred Offering: A sworn oath to slay at least six formidable evil outsiders in the coming year. If the oath is broken, the summoner agrees to serve the planetar unreservedly for 1 year. Solar – The most powerful angels, solars are warriors, trackers, guardians, and sages. Almost none can stand against their divine might. Preferred Offering: A neutral or evil sentient creature of no less than CR 15, who willingly pledges to live a life of piety and to follow the dictums of a good-aligned faith, and who you must ensure does so to the best of your abilities. Section 15 Copyight Notice: Pathfinder Campaign Setting: Chronicle of the Righteous. © 2013 Paizo Publishing, LLC; Author: Amber Scott. Angels can be of any good alignment. Lawful angels hail from Heaven, neutral angels from Nirvana, and chaotic angels from Elysium, though the majority serve one good deity or another and call their patron’s realm their home. Most mortals assume that angels never lie, cheat, or steal, are impeccably honorable in all their dealings, and are the most trustworthy and diplomatic of all the celestials; while this is generally true, there are exceptions, especially as some angels serve good-aligned trickster gods and other chaotic entities. The original and most powerful angels predate the mortal races. They were among the first creations of the gods of good, and those that survive to this day are among the more powerful non-divine beings in the multiverse. While new angels are still periodically created by the gods, most modern angels were once good mortals, their souls transforming into something greater upon reaching their destination in the planes. Often an angel’s true form is reminiscent of its mortal self, only taller, brighter, and more powerful. The relationship between good mortal soul and angel is common knowledge, and many mortal religions assume that all members of the faith in good standing become angels of some type in the afterlife. Others confuse the issue by conflating famous mortals (such as saints and martyrs) with preexisting angels that have similar names, or suggesting that angels take human form to perform great deeds as mortals, returning to the heavens when their duties are over. Whereas there are evil and cruel counterparts for all the other good races, the legions of fiends do not possess a clear analogue for the race of angels. Many scholars have debated the reasons for this strange lack of symmetry among the good and evil outsiders, and while most have come to believe that this is simply an example of good’s inherent willingness to rise above specific alignments for everyone’s benefit, the exact reason may never be known. Since angels can be of any good alignment, they represent the needs and desires of all three major good outsider races. While some angels devote their energies to all three, most have a particular favorite among the races in keeping with that angel’s particular alignment. While their true forms never vary between alignments, angels will often use their change shape ability to appear more like an archon, agathion, or azata as the situation and the angel’s personality demands. Angels are agents of good—in some cases the oldest and most powerful of such agents—who come from all the good-aligned planes to fight against corruption and guide the uncertain toward the path of righteousness. Some follow the tenets of law, while others embrace liberty or uncertainty, but all are committed to the ideals of justice. Angels conform to a unique hierarchy formally known as the Triad of Choirs. The most common angels are the two-winged devas, who compose the third choir. The less common four-winged planetars form the second choir, and the mighty six-winged solars command the lesser angels from their position in the first choir. Angels obey their internal hierarchy stringently, but also work with agathions, archons, and azatas—and even consort with empyreal lords and good-aligned deities—to promote goodness throughout the celestial planes and beyond. Most angels are formed from the souls of good mortals and retain some understanding of the mortal races. The oldest angels, however, were created by the gods of good, wrought and trained to serve as celestial guardians and servants from their conception. Those “created” angels who still exist usually serve the deities who brought them into existence, though other, free-roaming elder angels also wander the good-aligned planes. Most lawful angels hail from Heaven, neutral angels from Nirvana, and chaotic angels from Elysium, although this pattern isn’t set in stone and an individual angel might have a personality or philosophy that skews away from its plane of birth. This makes for lively debate and diversity among the choirs, as two angels of the same choir might tackle an issue in completely different ways. Regardless of their plane of origin, angels frequently travel between Heaven, Elysium, and Nirvana. Astral devas carry messages between these realms, solars directly serve the empyreal lords and good deities, and other angels perform a host of duties essential to the upkeep of the goodly Outer Planes. Devas in general prefer to monitor the planes and advise mortal agents rather than to confront evil head-on, with monadic devas often acting as liaisons between angelkind and other races such as genies. Solars have few limits on their behavior, but their motivations are often tied to the deities who granted them their awesome power. Because they are less tied to their home planes than other celestials, angels frequently build holdings in other realms of existence, often in hopes of furthering the goals of the virtuous. The Ethereal Plane makes a convenient crossroads for angels traveling to and from the Inner Sphere. A bastion drifts within the Ethereal, hidden in the swirling dreams of good mortals and protected from scrying and divination by powerful wards. Angels passing through the Ethereal Plane stop here to rest, share important information, or broker deals with otherworldly beings. The drifting dreams of mortals often inspire angels passing through to create phantasmagorical works of art. These living sculptures, paintings, and melodies swirl around the bastion in an scintillating haze of insubstantial monuments, colors, and sounds. Long known to be the source of life in the multiverse, the Positive Energy Plane also sometimes serves as a gathering place for traveling angels. The plane’s fiercely burning energies are hazardous to all but the most resilient travelers, so angels created a safe harbor in a silver-walled castle ages ago. This drew the ire of the plane’s jyoti, who keep a stern eye on the alien angels at all times. Within the castle walls stand permanent portals to the Elemental Planes, and angels visiting those planes via the castle often pause there to share information with others of their kind. The movanic devas who guard the fortress are notoriously skillful warriors, and some angels travel here simply to hone their fighting skills. Of course, angels have bases of operations on numerous other planes, including Orchard on the Plane of Earth and the constantly transforming Vale in the First World. The most powerful solars and, it is whispered, even some empyreal lords have constructed their own demiplanes elsewhere in the Great Beyond.